The missionaries of Saint Paul’s Outreach journey into the very heart of college campuses to bring the message and light of Jesus Christ to a generation desperately seeking truth and fulfillment. The result of this missionary activity is a renewal of culture, forming communities that awaken faith. This SPO community extends further than those on campus; it includes mothers, fathers, sisters, brothers, family, friends, alumni and benefactors all striving for the renewal of hearts and minds. The breadth and richness of the SPO community was seen and felt on Tuesday, October 23, when nearly 600 men and women poured into the Ohio Union to celebrate and support the great work God is doing to bring Faith Alive on college campuses, both in Ohio and across the country. Our keynote speaker Fr. Philip Merdinger, the founder of the Brotherhood of Hope and SPO’s national chaplain, spoke with great authority about the crisis of faith on campus. He shared the important role that SPO missionaries play in the lives of college students whose Catholic faith is “seriously challenged when they step foot onto campus.” He said that “it is not enough to have programs available to students through the institution of the Church, missionaries are needed to go where they are not wanted and to insert themselves into the life of the student body so as to bring them something of hope, something of Jesus.” As missionaries offer authentic friendship, “it is then that students can be invited to programs,” which do provide for an encounter with Jesus Christ. In addition to other students, Will Eichel, attested to the value of an SPO missionary in his life. Through this friendship, Will was invited to a retreat he otherwise would not have attended. On that retreat, during Eucharistic Adoration, Will said, “God broke into my life and changed it forever. The evening of the SPO Banquet was filled with many more wonderful moments, and we are so blessed for those who were able to join us. We also know there were so many others that wanted to be with us that evening who were unable to be present. Thank you to all of you who are part of this beautiful SPO community! We are grateful for your prayers and support that help us share the Gospel of Jesus Christ to thousands of students each year! You are in our prayers. Join us for our banquet next year, Thursday, October 24th. 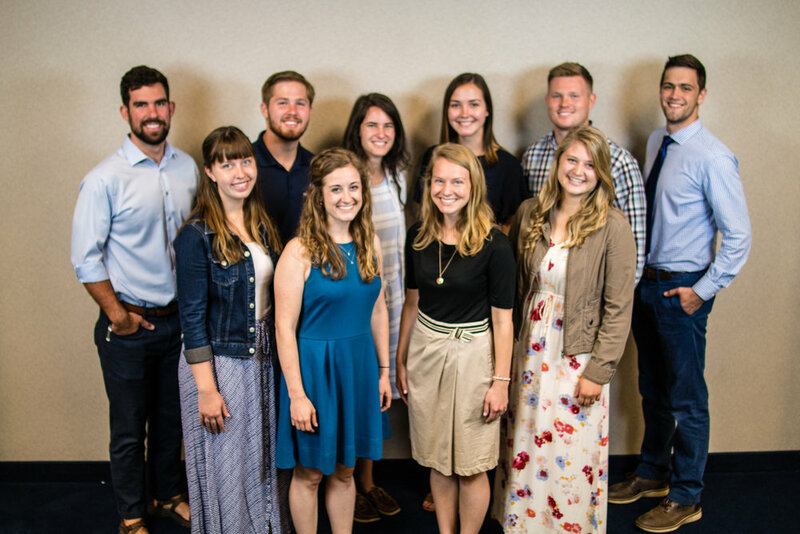 From June 1st to June 8th, our missionaries all gathered in West St. Paul, Minnesota for Missionary Training 1 (MT1), our first national staff training of the summer. In addition to receiving training on who we are and what we do in SPO, MT1 is the time when new missionaries find out where they are being sent and teams can begin to bond and prepare for the school year. Joining Household this year was nothing short of rewarding. As somebody who wasn’t attending Ohio State and only knew a handful of people when the year began, I was definitely a little nervous and apprehensive. Growing up with two brothers, I had never lived with other women, so when I was put into a house with fourteen other women, well, you could say I was a little intimidated. Our house, Siena, is unique in that it hosts two households: North and South. This year I lived in North Siena where there was plenty of spontaneous harmonizing and music videos made. Being a part of this sisterhood has been one delightful journey. Every woman in Siena is unique in what they enjoy and how they love, and the Lord certainly shed light on how each individual’s personality contributes to this mission of glorifying the Lord and sharing His gospel. Two households functioning under one roof threw a curveball into the household norm, adding a neat dynamic and creating an interesting bond between the two. Though we functioned entirely as two separate households, we share things like a laundry room and a staircase and entry ways, so seeing each other in passing, joining together for movie nights, and going on ice cream runs became quite common! Living so close to campus allows for great outreach opportunities. Our home is a welcoming place for friends to hang out, eat, or study together. It is special to be a part of a community who hosts fun parties and tailgates that are focused on building relationships rather than social status and drinking- like so many of the party houses that surround us. As a student attending Columbus State, living so close to campus helped me to feel like part of Ohio State as my bible study met every week in the library, and my friends loved to hammock on the oval or go skating at the ice rink! Siena has been a wonderful adventure and a real place of growth and ministry. Because of the large space we have, hosting outreach events, coffee houses (sharing talents within the community over coffee and desserts), and even celebrating Mass is possible. What an incredible blessing and gift Siena has been to this community. Looking back at the year, the Lord has done incredible things, not only in my own life, but in the lives of those we encountered, and I am so thankful I was able to be a part of Siena’s first year in action! We are grateful to all our benefactors and the Catholic Foundation who have made such a wonderful opportunity possible! Our group (Antonio, Joe, Mike, Tim, David, and Jeff) at the Observation Point overlooking Zion Canyon. Spring break was a week filled with relaxation for some, and adventure for others. A group of us were blessed with the opportunity to spend our break backpacking in Zion National Park. It was a week filled with adventure and rich brotherhood spent among the beautiful iron red canyons of Utah. Zion’s most popular hike is Angel’s Landing, which traverses the top of a ridge that is only a couple feet wide, at points, and has 1,000 foot cliffs straight down on either side. While the view was breathtaking, the fear of misstepping or losing a grip of the chain anchored into the rock was always in the back of our minds. It was dangerous, yes, but well worth the view! Plus, we had the opportunity to meet up with a group of guys from SPO Texas at the top! As incredible as the hike to Angel’s Landing was, the most memorable part of our trip was hiking to the west rim of the canyon at the end of the week. This is a particularly strenuous hike gaining thousands of feet in elevation in a relatively short stretch of trail. We hiked six miles uphill, all while carrying heavy backpacks. We began hiking and what started as a light rain soon changed to sleet and then finally a whiteout blizzard. We trudged for hours up a mountain through six inches of snow, unable to see what was around us. Sweaty, exhausted, and hungry, there seemed to be no end in sight. Just as our morale reached its lowest point of the trip, we arrived at the campsite that we had reserved for the night. We had finally made it! Quickly, and with frozen hands, we set up our tents in the snow. We changed into dry clothes and crammed all six of us into a three-person tent to wait out the blizzard. During this time, we shared stories, laughed together, and indulged in a lot of trail mix. What better way to build brotherhood! After a cold night with little sleep, the sun rose, illuminating a breathtaking view of the surrounding landscape. The view of the morning sunbeams piercing through the clouds onto a snow covered canyon made the misery of the day before well worth it! What a way to end an incredible week! The following week, back in Ohio, we heard a talk about the Stations of the Cross. The speaker emphasized that we can easily forget the experience of Jesus’ suffering by viewing the Passion as merely a series of stations. We know there is a happy ending, and each station seems like nothing more than a point on a timeline. At the moment of His Passion, however, the suffering was real and seemed endless. Hiking up the west rim of Zion Canyon we caught a small glimpse of this suffering, and the Passion of Christ began to take on new meaning for us. We have since told the story of our wintery hike to many people, but no matter how we tell it, we can’t seem to convey the entirety of our experience. None of us will ever know the entirety of Christ’s suffering and Passion. However, even though we only know a glimpse of Christ’s Passion, the morning is coming when Christ will rise and the morning light will pierce through the clouds, bringing hope, beauty, and salvation. A year ago, Ohio Dominican University (ODU), home of the Panthers, had eight students attend the Fan into Flame retreat (FIF) and that was what the Lord knew we needed as a community and a campus. However, this year, the Lord expanded our capacity to care and love for others and brought 22 faithful students from ODU to this retreat to encounter the Holy Spirit and only 5 of those students, including me, had attended the year before. These students came from all different backgrounds and for some, this was one of their first encounters with SPO. However, we were confident that the Lord would show up in more ways than we expected at Fan into Flame like He has been doing all year long at ODU. During Fan into Flame, it was incredible to see how the Lord was bringing our ODU community closer. People desired to sit next to each other during talks and at meals and spend time with each other during rec time instead of going and hanging out in their cabin or by themselves. The Lord placed the desire for community on the heart of those who attended FIF from ODU. Since the retreat has ended, I have seen this desire remain with the people who attended. There has been a game night where a lot of the students who attended the retreat came together on campus to play games and eat pizza as well as a student led opening of the Lord’s day, a dinner where we come together to honor the Lord and set aside the day, two weekends after FIF. The Lord has built an everlasting desire for community within the students from ODU who attended FIF. As a student leader in the ODU community, it was amazing to see how the Holy Spirit was pouring His love out upon those who have never felt His love before. There were many wounds healed and hearts opened at the end of the time of worship and praying together Saturday night, and when the retreat was over they were Panthers on fire with the Holy Spirit. These students knew that the Lord loved them and desired to be in a relationship with them and they wanted a relationship with Him as well. They could now go back to ODU and share this treasure of the Lord’s love with other students, staff and faculty on campus. At Fan into Flame 2018, where students learned how to worship as a part of the SPO community, claim Jesus as Lord of their lives and how to live a life in the Spirit, the Lord brought 22 students from ODU to encounter His Holy Spirit and equip them with gifts to show them His love and build His church. Now, these 22 students are a part of an army of Catholics on fire with the Holy Spirit at ODU, fighting to show others on campus His love.